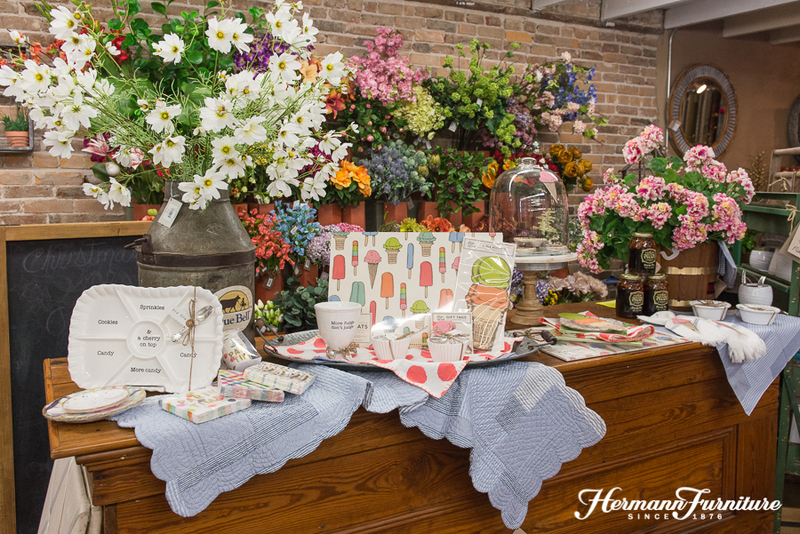 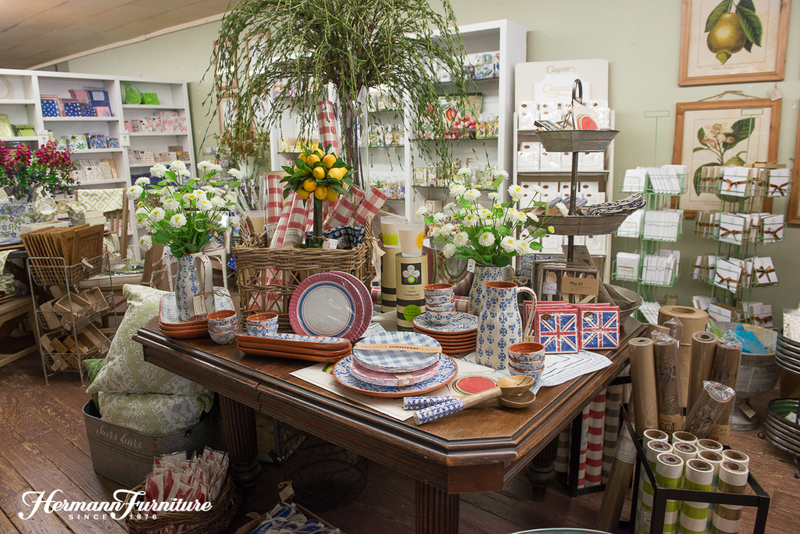 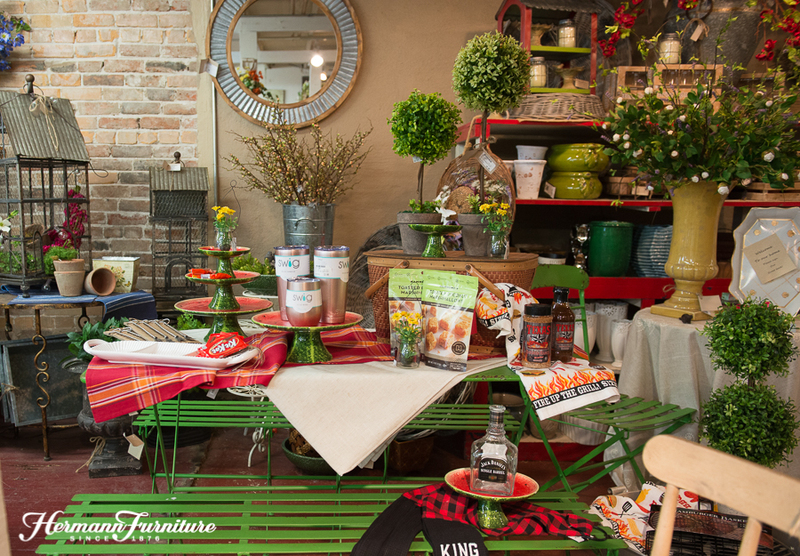 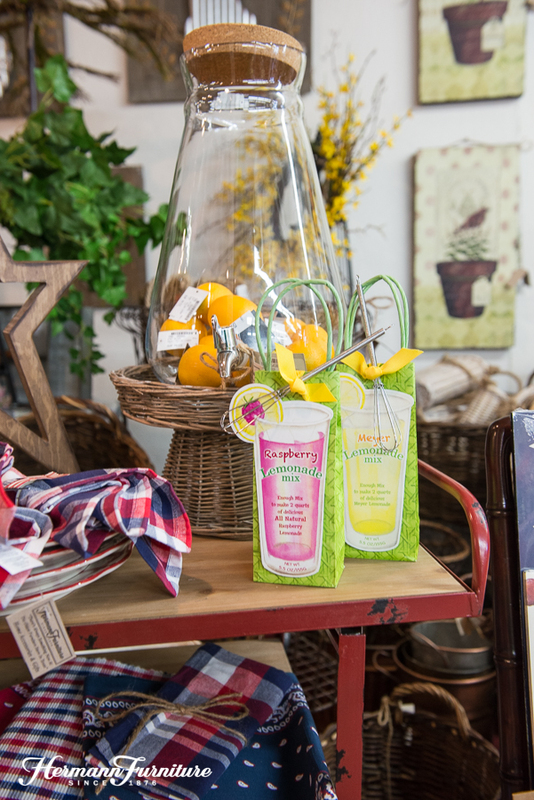 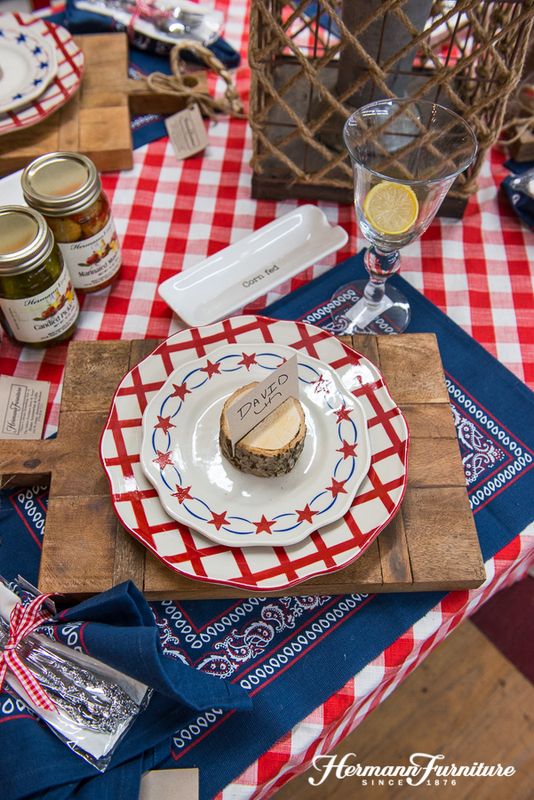 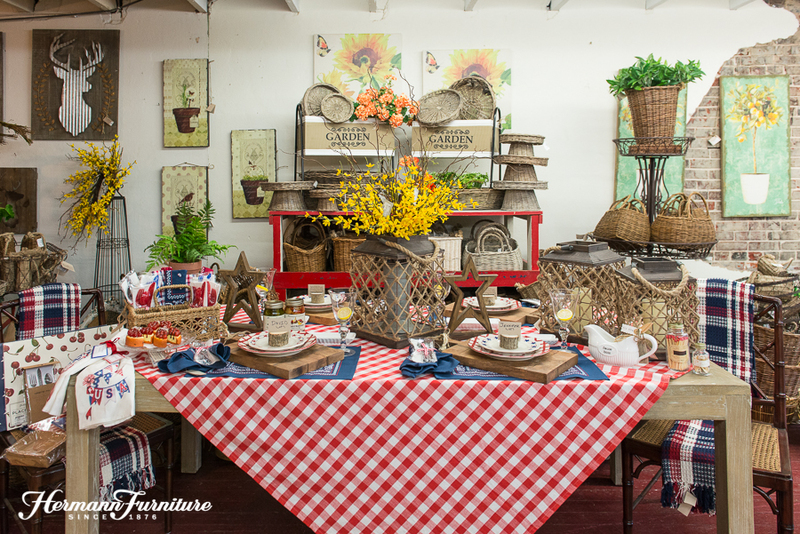 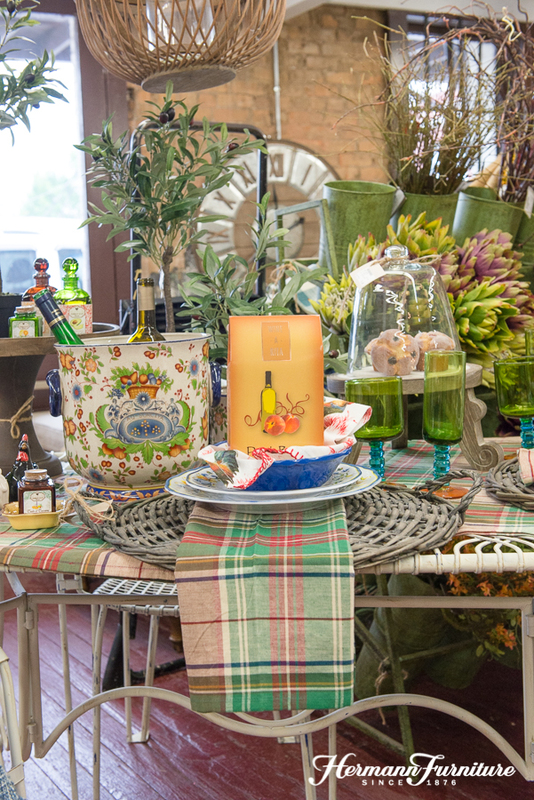 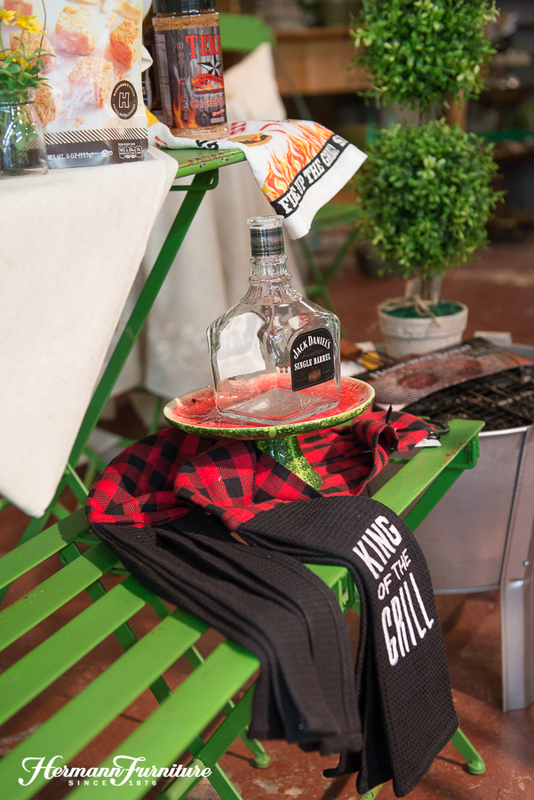 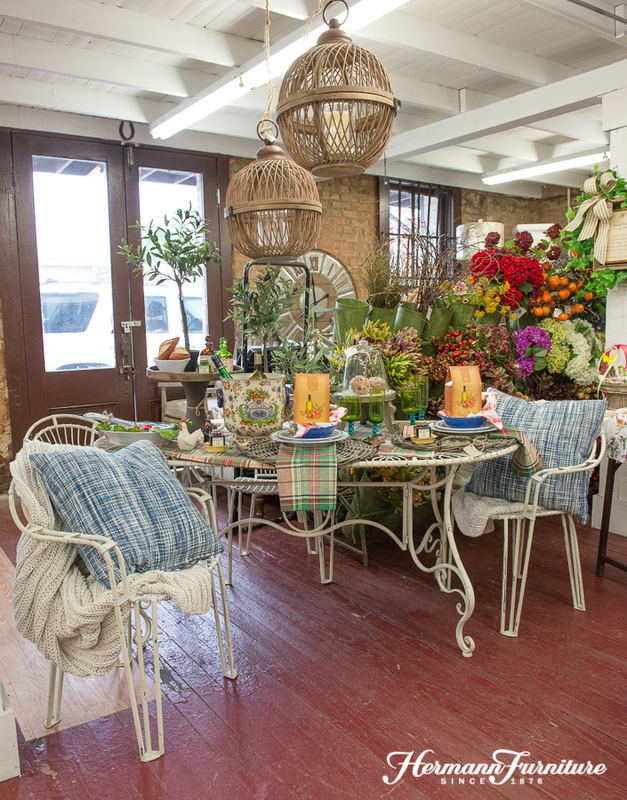 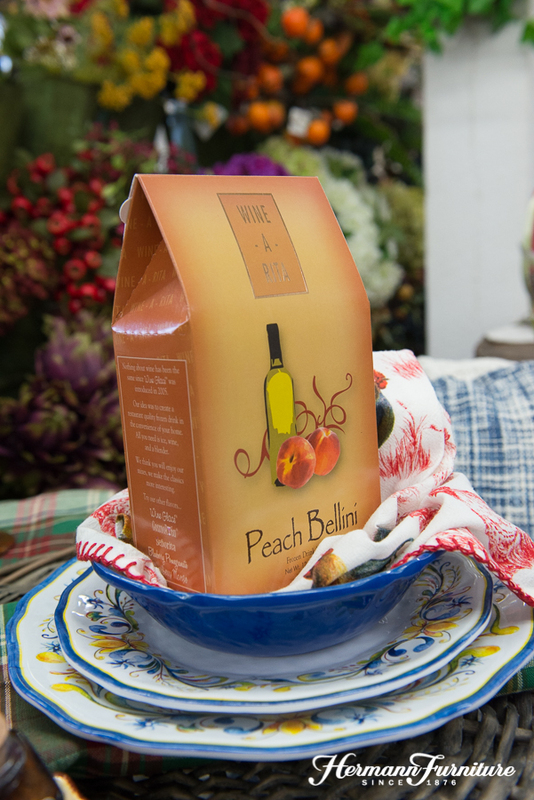 And in the meantime, if you’re ready to do some summertime entertaining, we have everything to make your table an inviting place to gather. 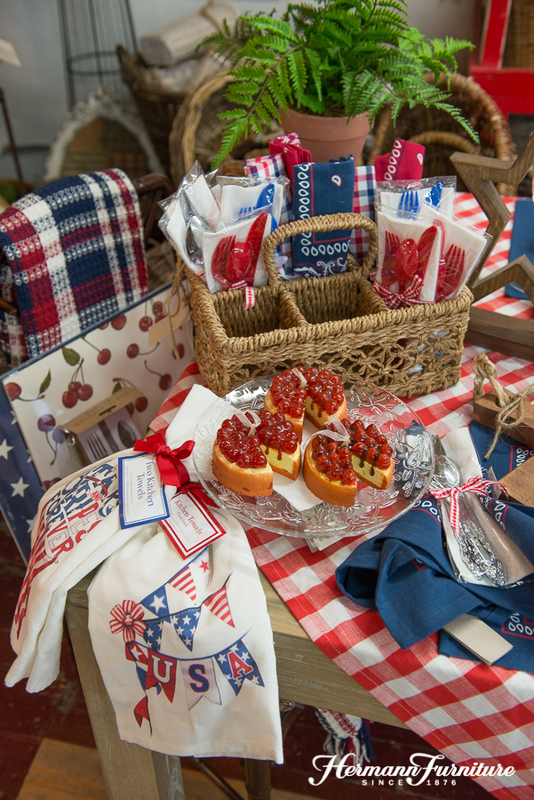 Red, white, and blue is a classic combo for summer. 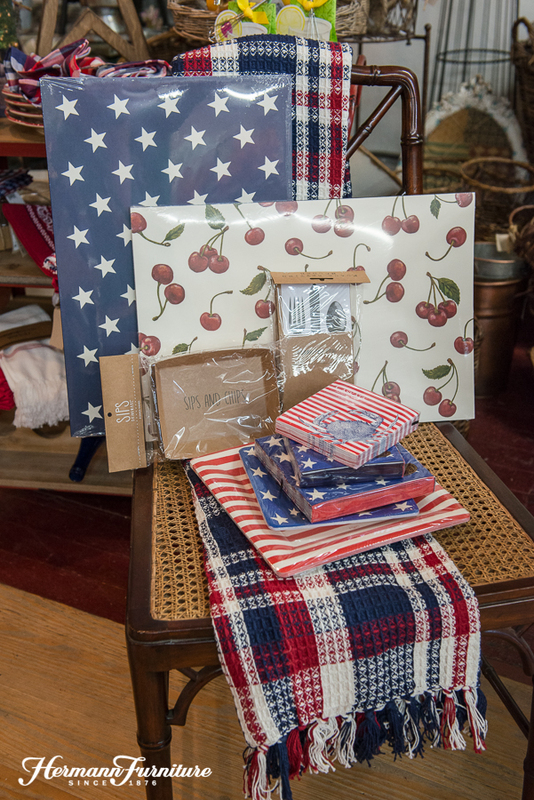 Use it for Memorial Day, Independence Day, and all through the season! 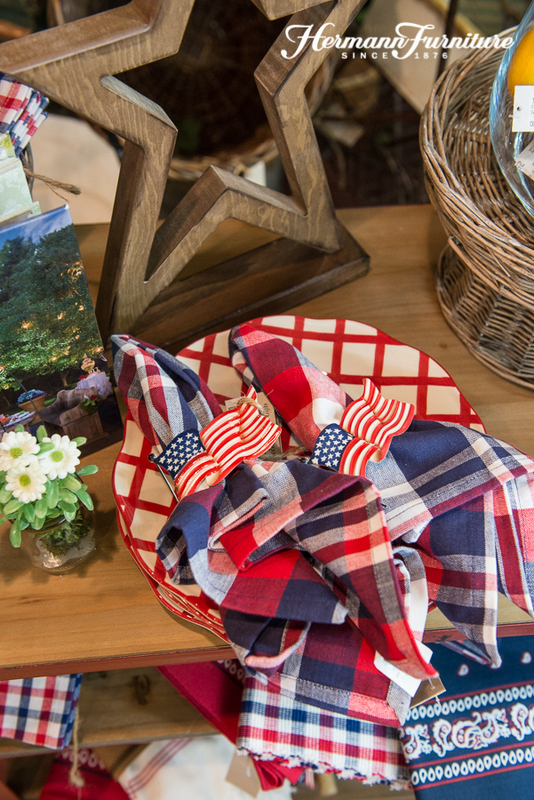 We have lots of inspiration in these patriotic colors. 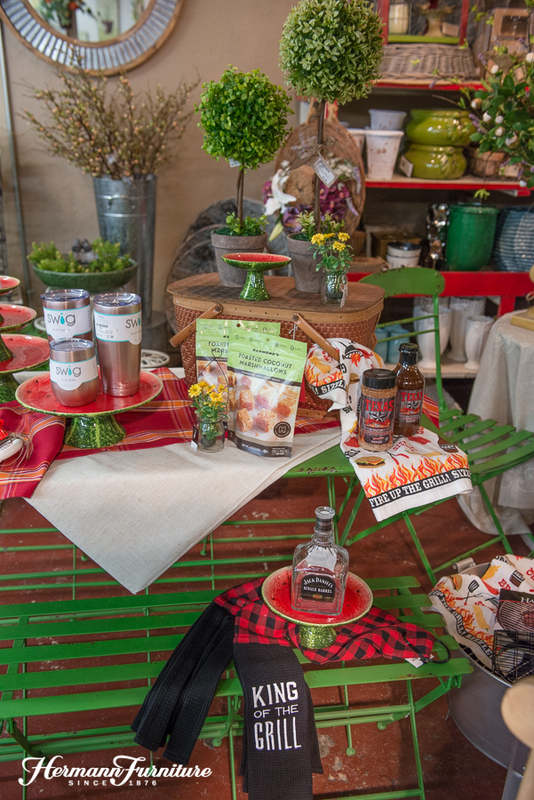 Be sure to check at Hermann Emporium for some of these gourmet food items and other great products! 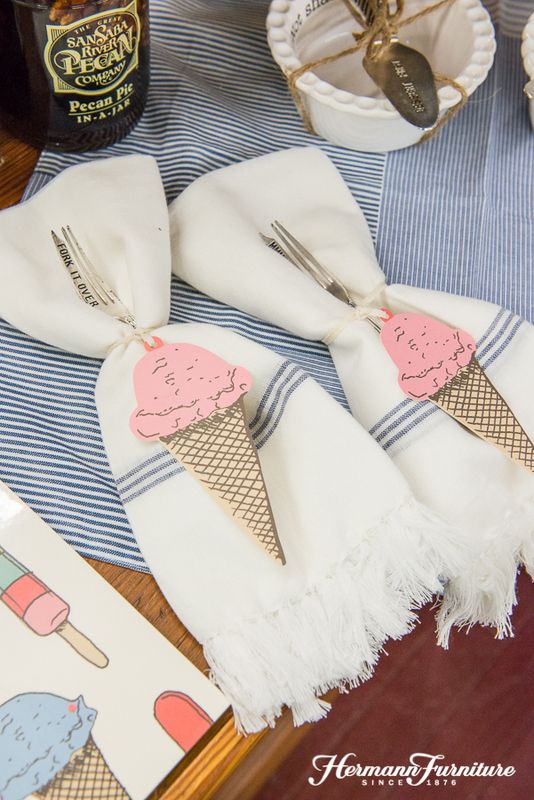 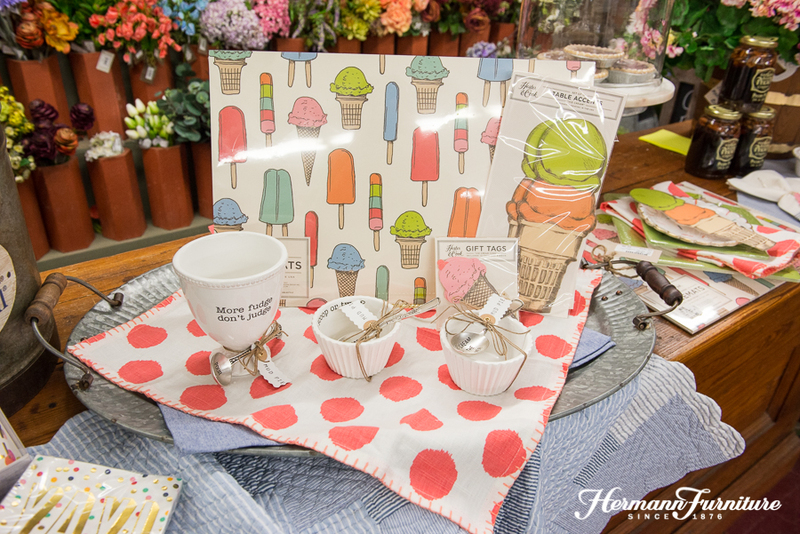 Many of these ice cream themed items are available in our online shop! 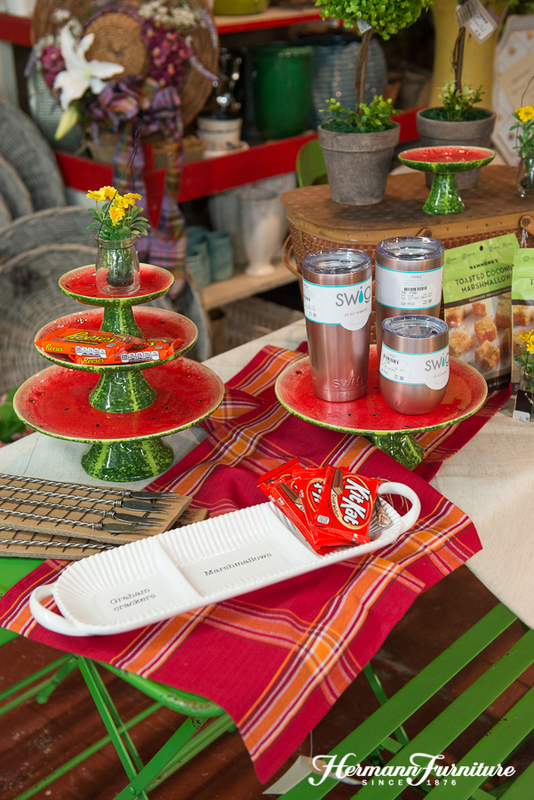 Below is a fun summer look–watermelon for the win! 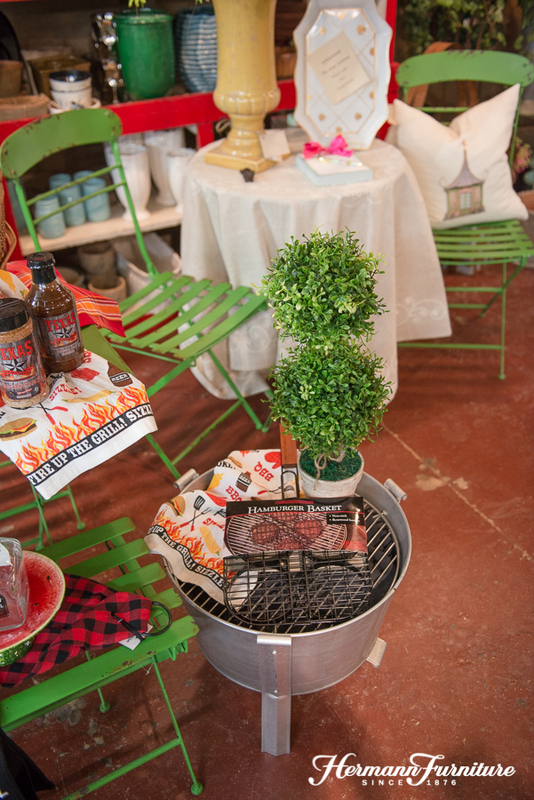 Grilling and beverage items are available at Hermann Emporium, located next door to Hermann Furniture. 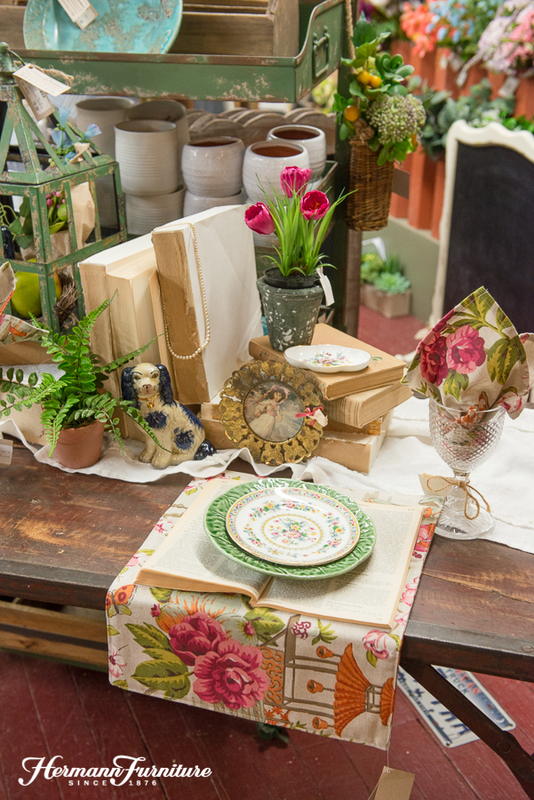 This Tuscan inpired table is so pretty! 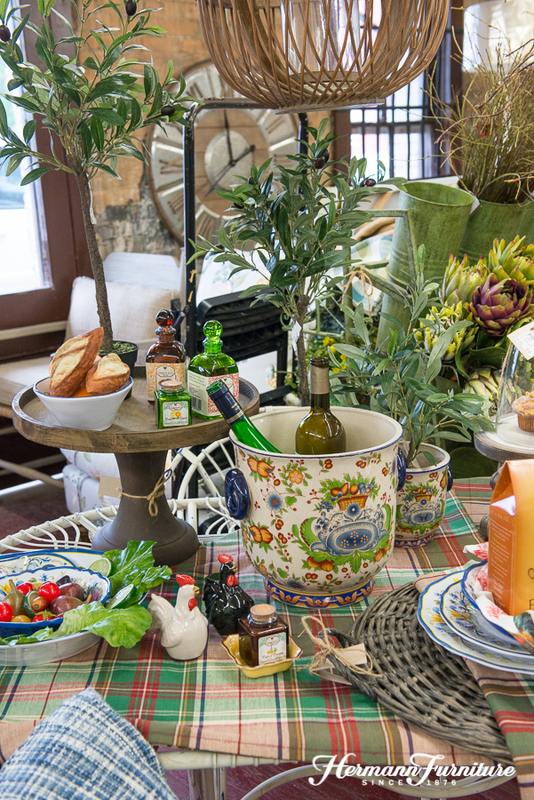 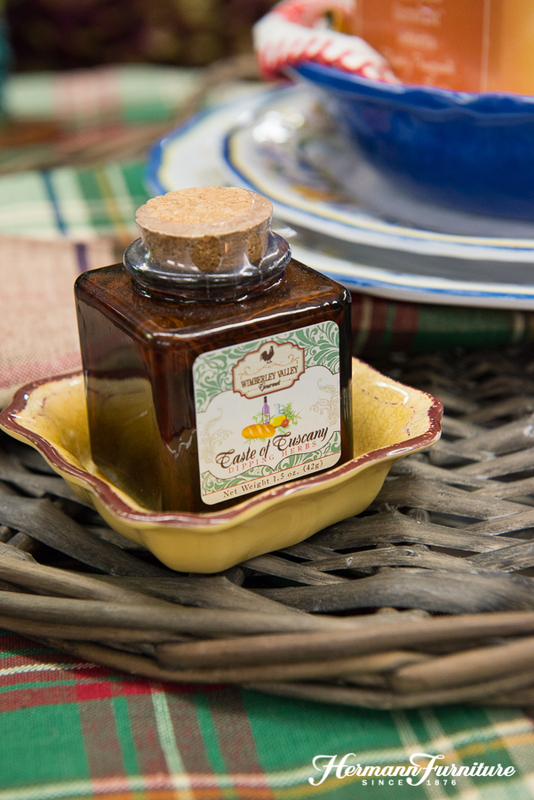 Gourmet food products can be found at Hermann Emporium. 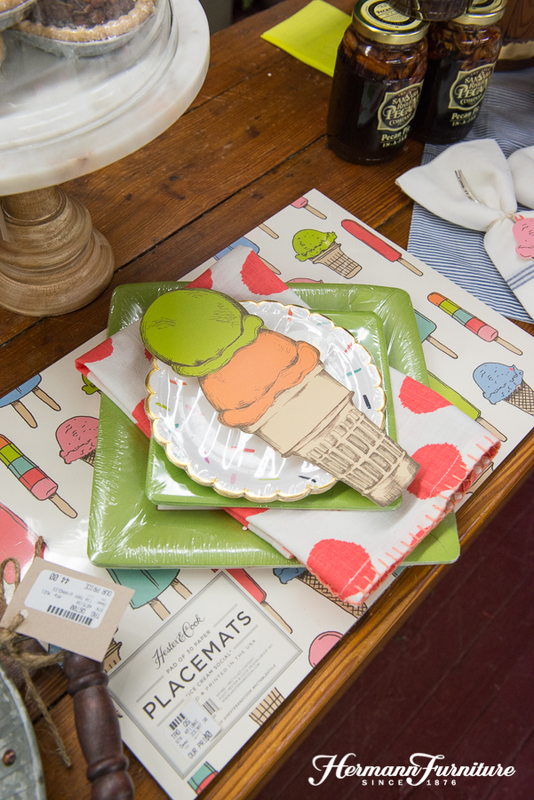 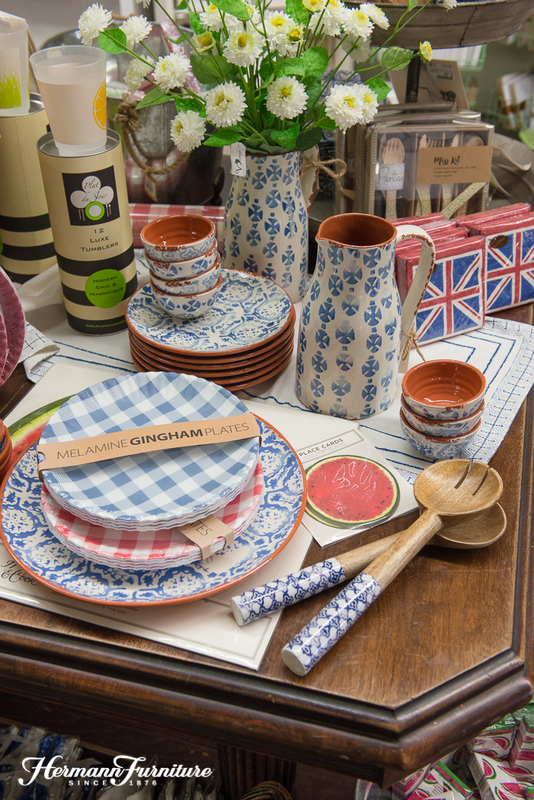 Many of the dishes are melamine or acrylic–perfect for dining al fresco. 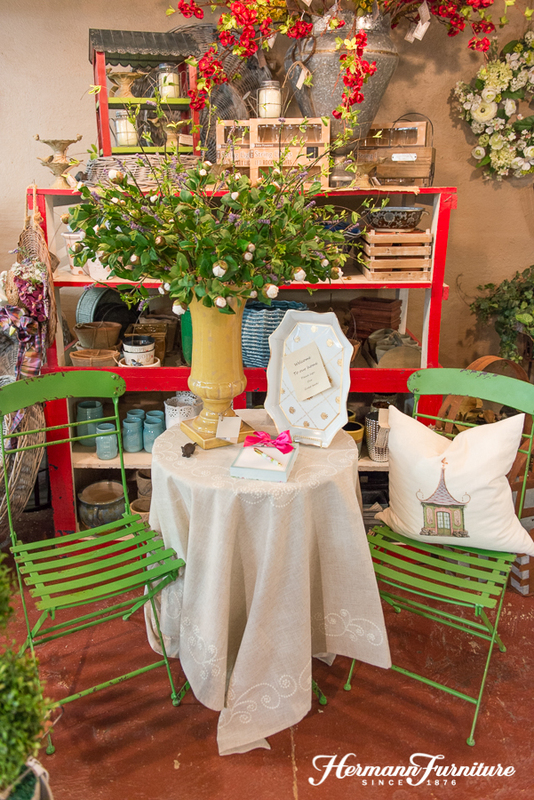 This next table would be perfect for a ladies luncheon or book club. 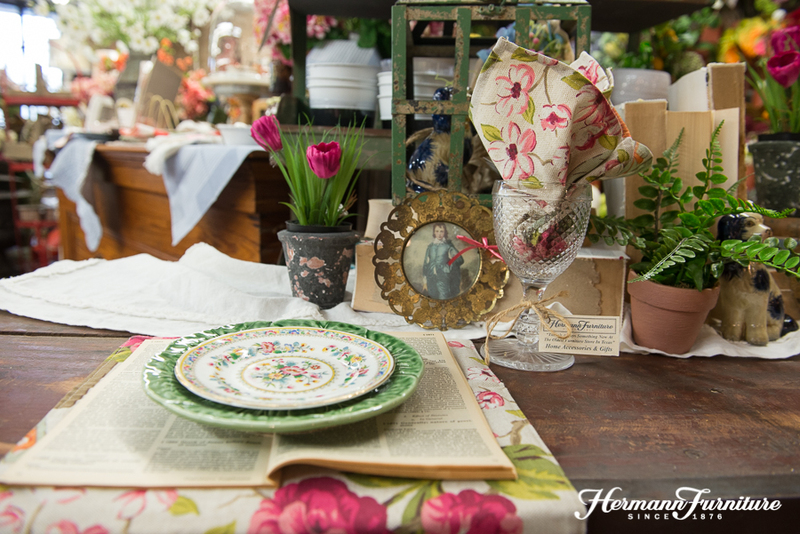 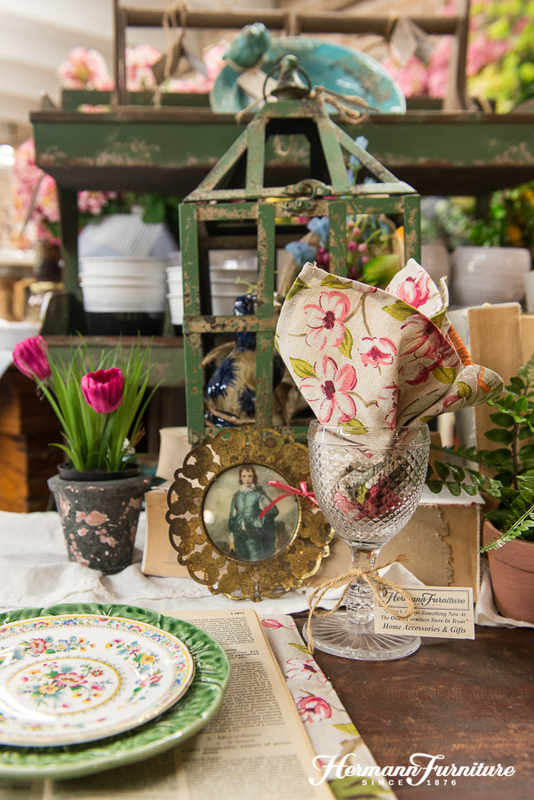 Old books are layered for the centerpiece and even used at each place setting. 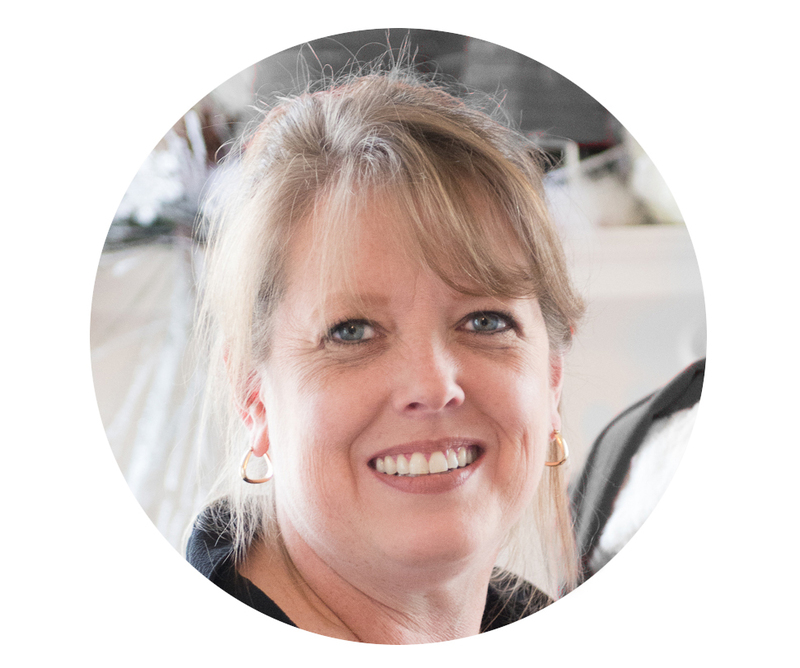 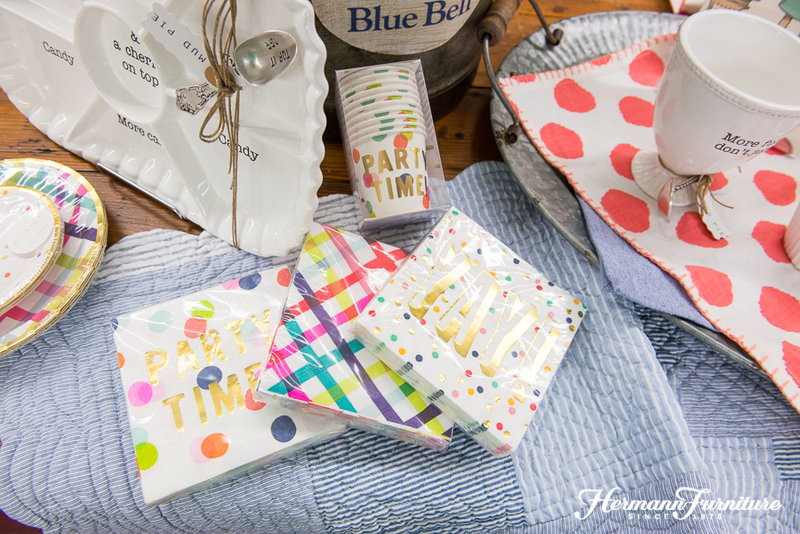 One of Jennifer’s favorite entertaining tips is to include a little sign-in book or notepad for guests. 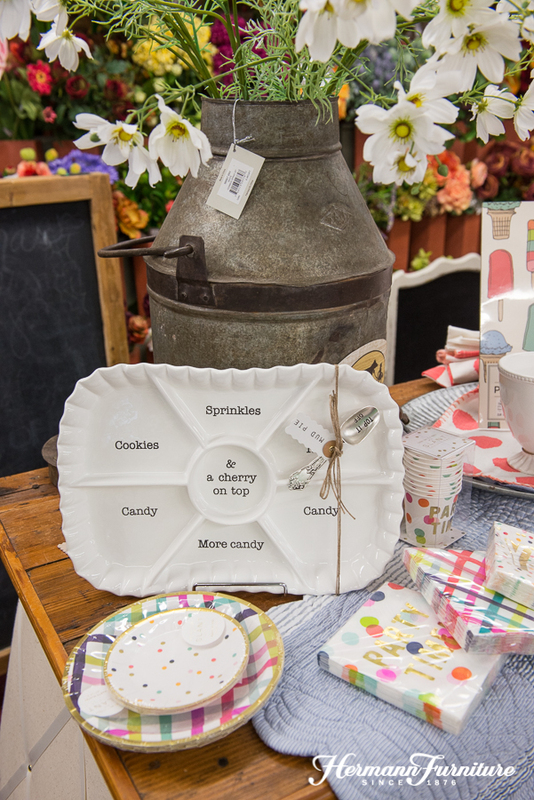 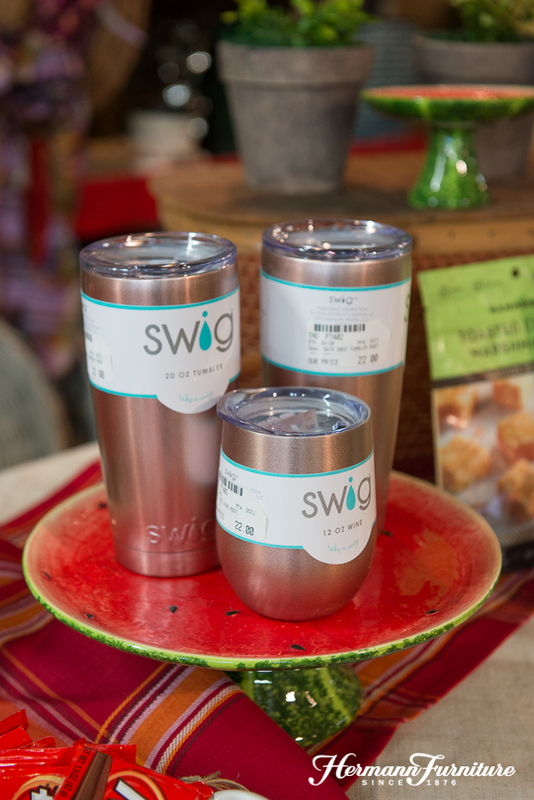 It’s a meaningful way to remember the sweet gathering with loved ones. 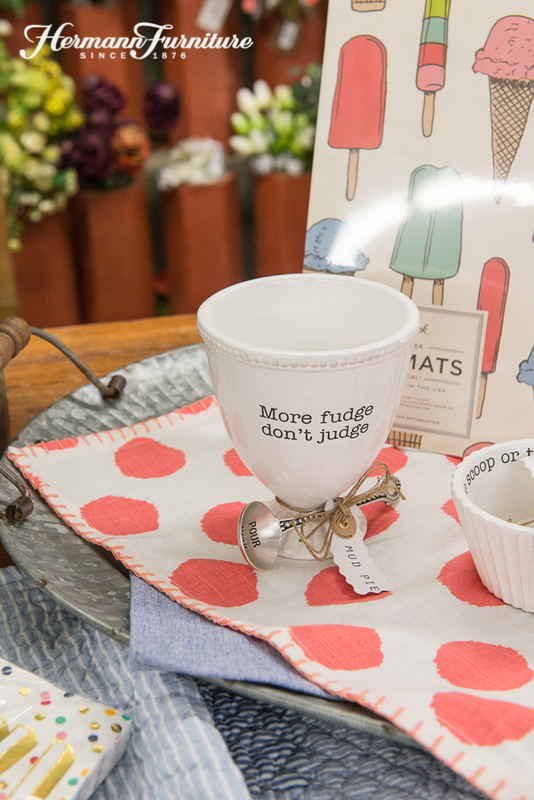 We hope you’re leaving with some great ideas and inspiration for your summer entertaining!